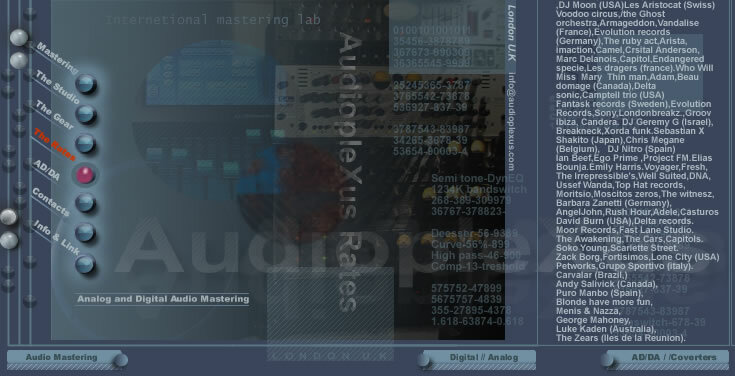 Digital mastering studios,AudiopleXus-cd mastering,mastering,mastering studios,audio cd mastering,digial mastering,mastering studios,digital mastering,cd mastering digital,audio mastering analog,digital mastering studio,cd mastering london,mastering studio,mastering service,digital cd mastering,mastering service,recording studios,mastering audio,cd mastering service,audio mastering service,audiopleXus. WE deliver within 48 hours anywhare in the world. Audioplexus Mastering studio as been open only fore one year with the best mastering tools available for today music industry. AudiopleXus also does restoration - declicking, denoising, dehissing. State of the art mastering studio London UK +44(0)20-8980-8947 Photo by Owen Davies info@audioplexus.com Navcool group Plc All Right Reserved 2004 2012.